So have you made plans yet for May 6th?? If you have-cancel them- unless you are headed to Mountain View! Here's why.. The town of St. Paul will be the hub for all things outdoors! 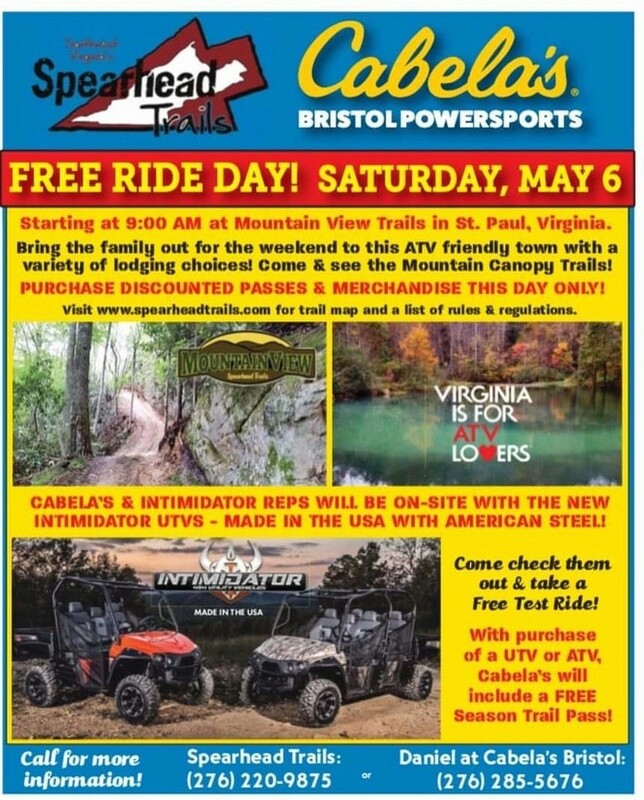 Not an ATV riders that's okay Cabelas will be on hand with outdoor gear and kayaks! Not an outdoor fan, well...okay.... Food City will be hosting their Car and Truck Show... IF you are an ATV fan... DO WE have a deal for you. AND its FREE! Mountain View will be hosting their free ride day and their first Intimidator ATV DEMO! You read that right. If you haven't tried out the Mountain View ATV Trail in St. Paul mark your calendar for May 6th and come see what its all about. The folks from Intimidator along with Cabelas will be bringing to St. Paul their all American made ATVs! With almost 100 miles of trails, 2 ATV friendly towns, Cabelas and Intimidator ATVS, you will NOT find a better place to be! In addition to riding that day for free, Spearhead Trail staff (only) will give you a $10 discount on your annual pass. $10 will buy you dinner or more fuel to keep riding!!! Whose coming? Wish I could make it however I’m not big on crowds.